Recently Ekornes Stressless has launched a brand new Stressless Dining Tables and Chairs furniture line — with this awesome endeavor in mind, we at European Leather Gallery have decided to tackle a common design problem: How to Design and Layout the Perfect Dining Room. The recliners created by Ekornes Stressless have been known to promote Nirvana-like states of comfort and relaxation. Here, in the Ultimate Guide to Ekornes Stressless, we’ll show you why. If you’re wondering what ultimate comfort feels like, this is it. Ekornes Stressless recliners are truly the most comfortable seating of all time. That’s a pretty strong claim to make, so we’re here to explain why. Already Know Which Stressless Recliner You Love? Visit Our Recliner Store To Start Your Order! Ekornes Stressless recliners go far beyond any other recliner you’ve ever known in terms of comfort, style, and craftsmanship. But don’t take our word for it. Smart shoppers always need to know more about a product before they commit… and we totally understand. Because let’s face it, luxury recliners like this aren’t found at the big box stores. That’s because they’re engineered with the finest precision to create the most comfortable seating on earth. Plus, superior craftsmanship and high-quality materials mean these beauties are built to last a lifetime and therefore carry a premium price. So it’s true: Ekornes Stressless isn’t for everyone. That’s why we’re offering you this guide to understanding the Ekornes Stressless brand and their iconic reclining sofas and chairs. Welcome to Ekornes Stressless… and get ready to be transported to the most heavenly comfort zone you’ve ever experienced! What Makes Ekornes Stressless Recliners Better Than Any Other? That unmistakable Scandinavian style. Those surprisingly convenient features. The unmatched quality of construction. The unbelievable comfort that almost seems extravagant. What is it about Ekornes Stressless furniture that sets it above the rest? Truth be told, it’s all of the above and more. Engineers who design high-end furniture know they have tough standards they have to adhere to. Like the elite engineers who are responsible for making famous German luxury cars the best in the world, Ekornes engineers have a similar role. If they don’t do their job right, nothing else matters. From the very beginnings of the company back in 1934, when German machines were imported to create the very first line of Ekornes furniture, the brand has always signified the ultimate in quality engineering. But what does that mean for you? Cloud-like comfort like you’ve never experienced before in any chair or sofa. Combining the latest in ergonomics research with solid principles of anatomical design to accommodate the mechanics and scale of the human body at rest, the engineers who design the foundation and structure of Ekornes furniture set the highest standards for themselves. Only the best will do, and perfection is the goal. The craftsmen who engineer Ekornes furniture have done their job so well they’ve created recliner chairs that adjust automatically to your body weight. Imagine shifting positions and hardly moving a muscle. Your recliner responds to the movement of your body weight and automatically adjusts to the position you desire. No levers to pull. No buttons to push. It’s like having a recliner that reads your mind. How does it work? Each Stressless recliner comes with Stressless Glide® wheels that can be adjusted to the setting you desire. Once you’ve chosen your setting, the recliner does the rest. First, the ErgoAdapt™ system will automatically position the seating angle the instant you sit down. Then, the Plus® System kicks in. This is what enables your Stressless recliner to automatically position the seat to support your head and neck. It also moves into the correct lumbar position so you feel almost as if you’re floating on water. It’s why this incredible line of sofas and chairs is called “Stressless”. Using the natural form and movement of your own body, the seating system responds to provide support and comfort on a whole new level. Once you’re settled in, you won’t believe how comfortable Stressless recliners really are. Part of the reason is the effortless reclining system but it’s also the construction of the furniture. The craftspeople who design and produce Stressless recliners are considered innovators of comfort. Form follows function, and the function of a recliner is to make you as comfortable as you’ve ever been. It’s not just the ergonomics. It’s not just the effortless reclining action. It’s also the trademarked Comfort Zones™ in each piece made by Stressless. The seat features perforated, super-thick foam cushions that guide you to the most comfortable position for your body. The result: you sink into perfect comfort every time you sit in your Stressless recliner. These premium luxury recliners aren’t just heavenly to sit in… they’re exceptionally beautiful as well. The refined design of an Ekornes Stressless piece hearkens back to the company’s Scandinavian roots, where simple lines and streamlined silhouettes set the tone. It’s a clean, modern look that fits into any decor, any home, and style and any taste. With all that goes into creating the most comfortable chair on earth, it would be an unfortunate oversight if Ekornes used anything but the absolute best in materials for their furniture. Top-grain leather. For many high-end products, the outermost layer of cowhide is the most desirable type of leather. Top-grain leather is supple, it holds its color, and has a uniform look that’s so important in the design of Scandinavian furniture. A strong base made from solid beech. One thing that really distinguishes top quality furniture is the use of solid wood in the structure of each piece. Ekornes Stressless furniture is constructed of solid beech plywood, which gives a strong, long-lasting wood frame. A rock-solid interior support system. The strength of a Stressless piece is made possible by a single steel rod frame. No welding and no screws on this frame: just one single steel rod that’s expertly formed to the perfect shape by the Ekornes unique cold bending process. Individual springs. Like a premium quality mattress at the finest hotel or in the most amazing homes, Ekornes Stressless is characterized by an internal system of individual springs. These springs are what make possible the superior lumbar support you’ll come to love. High-quality materials are great features to have in your furniture, but how does that translate to value for you? It’s simple, really: long-term value, the kind that creates legacy pieces for new generations. That single steel rod in every Ekornes Stressless chair or sofa is part of why these pieces last so long. The result of those premium materials like beech, top-grain leather, and steel is furniture so strong and durable. you’ll be able to hand it down for many generations. No matter how much stress you put on the frame, it will hold up and continue to provide amazing comfort. Top grain leather also adds to the long-term value of your Ekornes furniture. It’s incredibly durable, possesses amazing elasticity, and it’s more stain-resistant than other types of leather. You’ll be able to pass your piece down to subsequent generations and it will look practically like new. And the solid beech frame? It’s typical of high-end furniture that’s built to last for generations. It’s part of the reason why you’ll see vintage Ekornes Stressless pieces for sale on eBay at prices well over a thousand dollars! Not only can you find seemingly endless styles to match your home decor and your taste, you can also find design options to match your body’s needs. From all the exciting options for leather to the thoughtful custom features, there are a lot of choices to make. Here’s a quick run-down to help you get started so you’re ready when you visit our showroom. Batick Leather (13 different colors). For families who desire a touch of practicality along with style, comfort and value in their furniture, there’s Batick Leather. The protective lacquer coating means clean-up is a breeze. And if you’re just starting out, you’ll appreciate this option for its affordability. Cori Leather (16 different colors). Style mavens, this one’s for you! The tip-shine of Cori Leather offers a degree of depth to the surface while the substantial quality of the leather means a luxurious feel and long-lasting value. Our craftspeople have worked their magic to correct the leather and improve the pigment for a stunning look that offers an exclusive look that you’ll love. Cori Leather is always uniform in color so your decor dreams always come true. The durable pebble-like grain and the lacquer coating mean Cori Leather is not only beautiful but also practical. Noblesse Leather (7 different colors). If only the best will do, Noblesse Leather is Ekornes’ most luxurious option. Known for its heavy, rich qualities and its soft, breathable texture, it won’t disappoint. To retain its rich, luxurious look, it’s dyed all the way through. It has minimal top coating so it possesses a natural softness found in only the highest quality furniture around the world. As such, it requires a tad more maintenance than the other leather options… but it’s worth it! Paloma Leather (29 different colors). Paloma Leather is only slightly corrected leather so you get a natural variance in appearance that imparts a casual, yet luxurious style. It’s natural-looking and of course it’s oh-so-comfortable. It’s also amazingly soft to the touch so you always feel like you’re wrapped in luxury. Calido. Soft, flexible wool felt that’s naturally water-repellent and breathable. Crocus. Affordable, durable, and strong. Made of 100% polyester that comes in a wide variety of pleasing colors. Iris. For a style upgrade, Iris offers a boucle effect that, like tweed, blends a range of colors into the weave for a multi-dimensional effect. Karma. If your decor calls for a brighter palette, the Karma fabric is a good option. It’s easy to clean and super soft. Silva. Another wool option, Silva is a good option if you desire a classic look. Umbra. Silky velour with a noticeable shine for a modern look. Verona. Lots of modern colors that work in any decor. Siena. For the ultimate in durability, Siena is resistant to almost anything you and your family can throw its way: stains, sea water, sweat… even chlorine and acid! Luna. Like Verona, Luna is soft and suitable for any decor since it comes in a wide array of colors. Dinamica. Sleek modern look due to the ultra microfibre textile. Looks like suede, feels soft to the touch, and is extremely comfortable. It’s also washable and is made with recycled fibers. Ekornes knows people come in all shapes and sizes. That’s why they produce their recliners in three sizes. But that’s only the beginning. Stressless recliners can also be customized with two-way adjustable headrests that can be set to match the angle and the height of your body. The best way to find your true fit is to visit our Ekorne Stressless showroom and try them all for yourself. And of course we’re here to help answer any questions so you can find the Ekornes Stressless recliner that’s perfect for you in every way. Your furniture defines the look of your living room. The styles you choose and the colors you love help create the personal vibe you seek. But don’t forget that after all is said and done, it’s important that your chairs and sofas contribute to a healthy lifestyle, not just a beautiful one. When selecting a new chair or sofa for your living room, don’t forget to consider the impact it will have on your back. We’ll leave the design options up to you but for help with choosing furniture that won’t break your back, here is a good set of guidelines to follow. They’re worth considering if you care about the health of your spine… and judging by the long hours most of us spend sitting down, you probably do! What’s Wrong With Your Current Recliner? Does the color match the rug? Does it fit my unique sense of style? Do I love the way it looks? How does it feel when I sit in it? Can I stretch out and relax? Does it recline? Is there a matching ottoman? These are all very good questions. There’s nothing wrong with getting the right look but the way most people approach the comfort element is severely short-sighted. The feeling you get when you first sink down into a recliner on the showroom floor can be misleading if you don’t know what you’re doing. Does it feel soft? A better question would be: Does it support my back and feel comfortable? Another good question: Does it adjust to my body instead of the other way around? If you chose your current recliner because it felt ‘soft’ when you tried it out, there’s a good chance it doesn’t provide you with the proper support for long-term sitting and relaxing. For people who need to pay attention to spine health (and who doesn’t? ), that can turn into a problem — a very uncomfortable problem. Lucky you, since you’re in the market for a new chair and you can avoid that all-too-common mistake. So, what should you look for if not temporary show-room comfort and ‘softness’? Here’s what to do to ensure your living room seating pleases the body as well as the eye. Most people don’t think of their furniture the same way they do their clothing. That’s a shame since the right size is a key feature of back-friendly seating. You’ve probably noticed that people come in all different shape and sizes. Just as Goldilocks discovered, it’s just no good sitting in someone else’s chair. Just because a chair feels fantastic on Uncle Frank’s back, neck, and tush, it doesn’t mean you’ll find seating Nirvana once you try it out. Seating should be fitted to the person who’s going to be using the chair most often. Look for seating that comes in various sizes and then select the one that’s right for you. Consider height, of course, but don’t forget to check the width. Don’t assume that a chair that’s too wide will be suitable. It’s not just about making sure you can squeeze into the seat. A chair that’s too wide can mess with your spine just as badly as one that’s too narrow. For the vast majority of us, any seating that’s not good for the spine is bad news. The percentage of the population that suffers back problems at some point in time is shockingly high: 80 percent(1). If you can alleviate any problems simply by purchasing the correct size seating, this is a good first step. If you’ve ever driven a luxury car, one of the first things you might have noticed is how comfortable the seating was. That’s partly due to the extraordinary amount of attention given to lumbar support by designers of premium cars. Not only does good seating have lumbar support but it also comes fully adjustable. That means you can find the ideal setting for your back. It also means you can switch things up when you need a change during those long drives. It’s the same with back-friendly furniture. You’ll have the best outcome when there’s good lumbar support. Even better is when you can adjust the lumbar settings. That makes a huge difference during those long periods of sitting while bingeing on Netflix or otherwise relaxing for long stretches at a time. It’s not your typical living room seating that can adjust to the different ways you sit. That’s usually a feature of high-end office seating. It’s also not common to find seating that moves with your body but certain companies specialize in making chairs and sofas that can accommodate different activities. For instance, when you’re watching TV, it’s good to have neck support so you can see the screen without straining. The same goes for reading, where you’ll want to have your head tilted slightly forward. Your chair should cradle your head at the base, keeping it in a natural position. Napping, on the other hand, requires a different position. For comfort and maximum spine health, it’s better to have the head rest flat. Chairs that come with movable headrests are optimal so you can easily switch from reading mode to napping. ‘Easily’ is the keyword, since if the headrest is difficult to adjust, you probably won’t end up moving it at all. There’s no such thing as magic furniture, but there are chairs that can automatically adjust to your body weight and your position. That ensures not only maximum comfort but also better support for your back. Again, the keyword is automatic. If it takes any effort at all, most people won’t bother to turn that knob or adjust that lever for better ergonomics. Picture it yourself: can you imagine fussing with knobs while you’re transitioning from watching TV to slipping off into nap mode? Chairs have to be automatically adjustable (or at the very least, easilyadjustable) in order for you to enjoy the maximum ergonomic benefits your spine craves. People whose job is to advise other people on ergonomics will always tell their clients to keep moving throughout the day. Having a recliner that adjusts automatically (or at least easily) to a number of different positions will help you keep moving even when you’re sitting down at home. No matter what position you’re in, however, you’ll want to maintain the natural curve of your spine —especially your lower back. This is recommended by chiropractors giving advice for proper sitting(2). Features that adjust automatically to your spine may do a lot to help you keep the right position while sitting. Finally, there’s one more thing to look for if you’re seeking spine-friendly furniture for your living room. It’s considered the gold standard for ergonomic furniture standards: an endorsement from the American Chiropractic Association (ACA). This last criterion isn’t required, especially since it’s a rare find. But if you can score approval from the leading spine care organization in the United States, your spine is all but guaranteed a much better experience. Good luck in your search and here’s to your healthy back! Americans spend on average 13 hours a day sitting down. With all that time spent sitting, you want to make sure that you are resting in the most comfortable furniture or your body. Stressless Furniture innovates comfort for the optimum sitting experience. We have gathered reasons why our Ekornes Stressless Furniture would be a great addition to your home or office. Ekornes Furniture is worth the larger price tag and the investment because it stays in great condition for a long amount of time. This means that you won’t have to keep purchasing cheaper furniture that wears down quickly. Replacing furniture every few years doesn’t make any sense for your home or your wallet. This quality furniture is a smart investment. Ekornes furniture comes in recliners, office chairs, reclining sofas, ottomans, and even sectionals. They work well in many different areas of the home and office. With all of those style options, you want to make sure that you are getting the most comfort in each piece. This furniture has a mind of its own which is adjustable with body interaction. This ergonomic support helps make the furniture adaptable to many different scenarios and people. Stressless recliners have done away with some of the preset positions you are used to. It allows the furniture to read and work with the body to find the best reclining position. The proper support is one of the many reasons people love Ekornes furniture. Ekornes furniture has been combining functionality and utility with style for decades. They are experts in furniture that works well and looks beautiful as well. Many designs and materials to choose from that will ensure the furniture fits the rest of the features in that particular room. This allows you to customize the piece to best fit your needs. They have mastered the little details that make the design. There are a wide selection and variety of colors for the leather and stains for the wood base. This isn’t a one-size-fits-all furniture situation. This furniture is guaranteed to become one of your favorite pieces because you help design the look of it. What makes the Ekornes Stressless furniture stand out from others on the market is their innovative technology. This is how the furniture works with your body to provide the most comfort for your specific body and position while resting. The last thing you want to do is waste time in uncomfortable furniture. Take a look at all the Stressless furniture options that we have to offer to complete your home. Have you ever tried sitting in a piece of Ekornes Stressless furniture? If you haven’t, you have to go try it out now. Trust us when we say it is an amazing feeling. But what makes this furniture so much more comfortable than other types? Let’s look at 4 benefits to show you why this furniture is so amazing. Hands down Stressless furniture offers amazing head, neck, and lumbar support. Proper ergonomics in an office chair is vital. Around 33% of all work injuries are musculoskeletal disorders. These result largely from sitting incorrectly for hours on end. The back support and headrest are both completely adjustable. Choose whether you want to be upright or in a reclining position. It’s easy to get into a comfortable position. Simply make easy hand adjustments to get there. You are not confined to one direction while seated in our chairs. We know that once the chair envelopes your body you won’t want to stand up again anytime soon. But with the 360-degree swivel base, you can easily change directions. All it takes is a gentle push with your foot. The bases feature a double stem design that makes them super stable. In fact, these are the most stable of all swiveling recliners. Stressless furniture uses a unique system called the Glide. The system adjusts the position of the chair with ease. On either side of the chair, you’ll find a rod with a tension knob or wheel. Simply set the knob when seated in the chair. This will set the tension for your particular body weight. Now all you have to do is lie back and the chair will move with you. It is the same for coming back upright again. Simply shift your body weight and the chair will move. It’s completely handsfree which is so helpful in many cases. To ensure authenticity, check for the Stressless logo on the little wheel. Another awesome thing about Stressless is how the furniture looks. There are several materials that you can choose from. All are of the highest quality and rest assured they will last for years. Ekornes chooses only top-grain leather hides. Each has to pass their strict quality control tests. They come in a variety of colors so you are not restricted to only a few options. You can also choose any of the microfiber or woven fabrics they offer. The company makes the base from European beech. But there is a variety of stains you can choose from. This gives you flexible design options so you can create your favorite look. Ready to Buy Stressless Furniture? Are you starting to see Stressless furniture in your future? With all these amazing benefits and the furniture’s affordability, it only makes sense. Take a look at our virtual showroom or better yet come visit our store! Once you sit in a Stressless recliner you will be ready to buy one. When you do, your back, neck, and shoulders will all thank you for it. When I’m looking for inspiration, one of the first things I do is go straight to the internet. Whether I’m looking for DIY projects, interior design ideas, or just looking to understand current trends there are tons of great websites created by professionals and amateurs that I look to. While Pinterest is a good resource to see what other people are ‘pinning’ I’m partial to blogs and designer websites. You might be wondering “why should I care about what designers or bloggers think?”—well, that’s a good question, and the answer is simply: these site owners and bloggers are some of the most passionate about design, decoration, renovation, and virtually any other aspect of home decor you can think of. Who better to look to for inspiration than professional designers and highly passionate bloggers? Without further ado—here’s our favorite interior design and home decor blogs. Get ready to bookmark these great blogs. We’re starting off here, well, because first and foremost we absolutely love Scandinavian design. Ekornes Stressless is an iconic Norwegian brand and that’s where my heart and mind go when I initially think of design. A very Scandinavia-centric site, it is a great one-stop destination for Scandinavian lifestyle (not just design) in English. If you’re a “Scandiphile” (their word) this is where you can get a feel for Scandinavia wherever you are. One of my favorites from the site: The White Rooms — this is a photographic tour of apartments and office spaces. Also look for their “Scandi-Six” pieces—six item blogs on some aspect of Scandinavia. “Dos Family is about good looking sofas, fleamarket findings, TV, how to build a diner with toys, country living, everyday life, food, felt pen-tattoos and home tours. It’s all about the strange and beautiful thing called inspiration, really.” The Dos Family site has been around since 2009 and is run by Jenny Brandt, a Swedish interior design photographer. If you’re not sure where to begin on the site, check out their New Reader Intro page — you’ll be able to find some of the most popular posts there. This is one of Sweden’s oldest design sites (it might actually be the oldest)—it was started in 2005 and focuses on the minimalism and functional styling of Scandinavian design. One of my favorites from the site: Dream Summer House — I love the large wall of windows in this house and the simple concrete and wood materials. 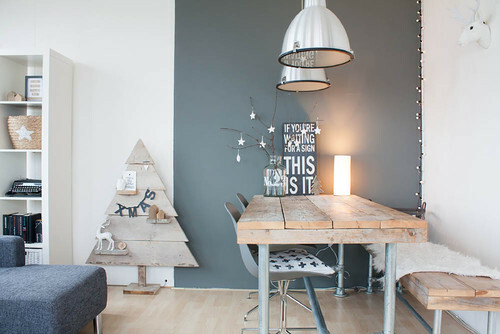 One of my favorites from the site: Workspace Inspirations — I love the design ideas for office spaces here. This might be my favorite office set (but it definitely needs one of our amazing Ekornes Stressless home office chairs). Bungalow5 is a Danish blog for people who are passionate about design and anyone seeking inspiration and unique ways to decorate a modern, comfortable and stylish home. The site is owned by Allan Torp, a fashion industry and PR professional. Instead of sticking with the tried and true “project based and DIY blogs” Allan wanted a more design-inspired site that put the spotlight on simple and fresh Scandinavian inspired design. One of my favorites from the site: This is My Favourite Spot — the first time I came across this post I expected to see pictures of one area of a house. Click through to be pleasantly surprised by the “favourite spot” in the post. It gave me the idea to do something similar in my own home! This is a London blogger’s Swedish design site. I love how simplistic the site is to match it’s focus on Norwegian/mid-century minimalist design. Just as the name implies: this is a curated site with lots of Nordic and Scandinavian inspired design along with photos and blogs for inspiration. Deals with more than just interior design, Igor the site’s owner includes lots of categories to get an idea of the wide range of this style of design. There are some beautiful and amazing interior design shots on this site. You can easily get lost for hours here if you’re in the ‘research’ phase of a project or renovation. I really enjoy the before and after posts she does. One of my favorites from the site: Before + After: Client Z to the E to the N — it goes from a dark, uninviting (in my opinion) space to a bright, open kitchen and I can honestly say, I would love to prep a big family meal in there. This is a great blog for the DIY interior designers, this is a quintessential lifestyles blog—with a little of everything, including recipes and travel inspiration. Personally that’s not my cup of tea, I much prefer the interiors section with all of its organic materials and modern looks. Brittany is an accountant by trade and decorator by passion, and it comes through in her posts. There’s a logical order to her inspirations. This is much more of a DIY-type site, and less ‘professional’ than others, but what she posts is no less beautiful. One of my favorites from the site: Ikea Hack: Mid Century Bar Cabinet — this would look great paired in an open concept living area with one of our Stressless sofas and recliners for a true mid-century modern look. It would be kind of silly to leave Design*Sponge off any list of great design blogs. I like that Grace, the site owner, doesn’t shy away from color. Looking at her interiors sections gives a reader ideas to combine color and simplicity into lovely living spaces. Ok, so we’ve been featured on this site before, but that’s not why I love it. Deb posts beautiful shots of her DIY updates to her home. I like the simplicity of many of her designs and the way she tries to stretch a little into a lot! One of my favorites from the site: Design Boards — this is a bit of unique spin on ideas. I like how she sets up design boards for different rooms and it’s great if you’re not sure what style you’re looking for. This blog is by a freelance web designer and the themes around the site are about designing small spaces effectively. This is not your typical design blog. The site is sort of a cross between storytelling and design history with home and lifestyle design added in. Jenny is a Phoenix area blogger and designer—her stuff has been featured in some really big publications like Better Homes and Gardens and HGTV. She’s been sharing her insights and favorite projects on the blog since 2007. One of my favorites from the site: Bavarian Forest Walls — I’m not usually a fan of dark colors in rooms, but for some reason this just works. I especially love the idea of “nightstands” (which are really wall mounted shelves). There’s a little of everything here—this lifestyle blog is run by two sisters and they share home decor, food recipes, and crafty projects. Like I said, you can find a bit of everything on this blog. One of my favorites from the site: Gotland Sweden Travel Tips — I dream of going to Sweden but haven’t been, scroll down to the comments section to read some great travel ideas. In Jessica’s own words: “I am particularly obsessed with flowers, crops, produce, and the countryside which surround me here in Wisconsin. I also find endless inspiration at our local farmers’ markets and farm stands.” This blog is all about color—she creates color palettes inspired by nature and produce. Just a cool, very different type of design blog! A leading interior design blogger from San Francisco (but now living in LA), this site is about ‘Bohemian style’ and showcasing designers, trends, and products. Victoria Smith (the owner) also focuses on thrifty/affordable finds for creating your style. Just a great, unique style blog. One of my favorites from the site: DIY Mid Century Desk Wall Unit — I really love multi use projects, and this ‘bookshelf’ and work desk setup is a great example of that. Apartment 34 offers inspiring ways to add sophisticated style to your life. On the blog, they share modern décor, classic style, must-make food, wanderlust-worthy travel – all the good stuff that makes day-to-day life a little bit better. L.A. based designer and blogger Justina Blakeney loves “boho aesthetic.” Her blog highlights her passion for color, pattern and plants, and TheJungalow.com, has quickly become a go-to source for bohemian design inspiration. One of my favorites from the site: Tour the Jungalow — I really love home tours, to get an inside look at other people just gives you a little bit better understanding of the person behind the blog/home. I love the amount of color throughout Justina’s jungalow! Igor Josifovic started Happy Interior Blog in 2011 with the intention of bringing more happiness to our homes and lives. His blog focuses on interior design and decoration ideas for happy homes, showcases the beauty of the world and inspirations he has brought home through his travels. Something a little unique to HIB is that Igor loves to highlight the beauty and beneficial power of houseplants. The Inspired Room is a decorating blog designed to help you love the home you have. For two years in a row (2014 and 2015) it was voted the Reader’s Favorite Decorating Blogger at Better Homes & Gardens magazine. The site is aimed at budget conscious homeowners that appreciate good design and a well-kept home. Kelly Elko uses her blog to mix old and new. Her blog displays collections and highlights decorating tips. She also uses flea markets finds, estate sales, and unique items to create here ‘eclectic’ style. Designer and blogger, Kristin Jackson created Hunted Interior to inspire readers to “hunt for their own style” and teach them how to accomplish it on any budget. She has had years of experience as an International Hotel Designer and knows the importance of creating a luxurious space & making every dollar count. One of my favorites from the site: My Favorite Design Books — I love book roundups and if you’re interested in interior design and decorating, this is a great booklist. Have you found this list helpful? Spread the love and hit the Facebook or Twitter share button. Do you know of an interior design or decorating blog you think should be on this list? Add a comment and let us know! We’re always interested in reading and seeing more beautiful and inspirational designs! You’re probably familiar with this scenario: you’re busy working, and suddenly you’re reminded of that terrible back pain. Sometimes, working hard can truly strain your body. These pains are awful for your health but reduce productivity severely. Like any other serious-minded professional, you want to decrease your pain and get back to working hard. So what’s your best option? Upgrading your furniture. But how do you find ergonomic furniture that fits your budget? Ready to relax your neck and back? You can achieve a pain-free work environment by following these tips. Continue reading if you want to know more about ergonomic assessment. Are you too tall or too short for your office chair? You probably don’t notice how often you look down or look up at your computer. That sounds like a lot of neck pain, right? Well, it certainly is. And the more you strain your neck too high or too low, the worse the pain will get. Find an adjustable chair. This way, you can adjust your height to your computer. Make sure you’re looking at the computer at eye level. This way, your neck is straight while you’re looking at your computer. Ekornes Stressless chairs offer head and neck rests. These will give your head and neck more support. One of the main reasons why professionals experience work-related pain is how separated everything is on their desk. With all of that space, your mouse may be on the opposite side of your desk. And your coffee might be on a completely different shelf. Using a small table helps cut back on reaching for different materials. For more comfort, use a table attached to your chair. These tables are small, so you’re forced to use only necessary objects. And since you’re relaxing in a comfortable chair, you won’t want to get up. The easiest way to decrease your pain is to buy an ergonomic chair. But buying a comfortable chair doesn’t mean it’s going to be expensive. But there are features you should look for. The design of the chair is important. Make sure the chair has lumbar support as well as a head and neck rest. To improve lower back pain, find a chair that shifts with your weight. The most comfortable chairs are usually made with a combination of leather and fabric materials. Sitting at your desk and staring at your computer contributes to several issues. Experiencing pain while working is not uncommon, but it can be fixed. Fortunately, you don’t need to spend lots of money at the doctor’s office. You can decrease your pain by upgrading your furniture. Make sure your chair is comfortable and is adjustable. Find a chair that comes with added features such as a built-in desk. Use these ergonomic assessment tips to find the best office furniture. Are you ready to buy pain-relieving furniture for your office? We have all of the best home office chairs to reduce your pain and discomfort! Scandinavian design has mastered the art of being simple without being austere. For holiday décor, you’ll find neutral colors with small touches of holiday cheer in place of traditional Christmas clutter. Decorating your Scandinavian-themed living room is a matter of selecting the touches you want to emphasize. Your staple colors will be white, silver, and some gold. 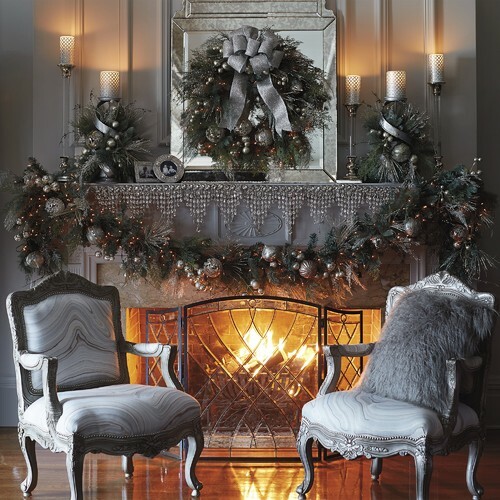 White lights, simple ornaments, and neutral throw pillows will create a tasteful holiday feel. From there, you can add occasional reds, greens, and even blues that evoke the azure tones of snowy landscapes. Stressless furniture is the perfect backdrop for holiday decoration. With simple lines and neutral colors, it provides the framework of simplicity that you can embellish as needed. Mixed in with neutrals, splashes of bright colors add interest without overwhelming you with holiday fervor. 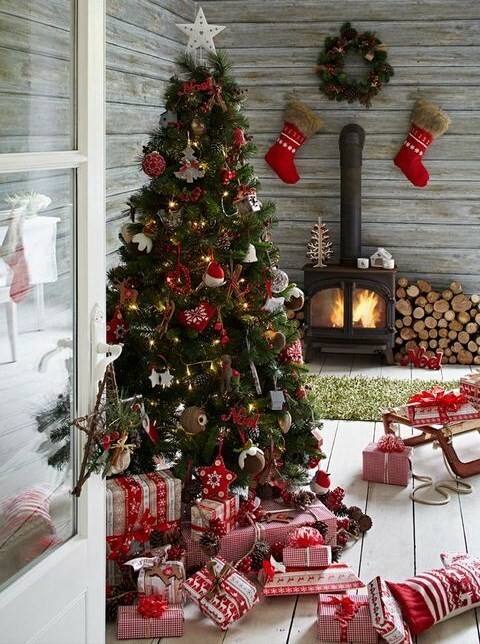 A red, wool blanket, green wreaths, brightly colored bulbs for the tree, and candles add holiday cheer while remaining relaxed. 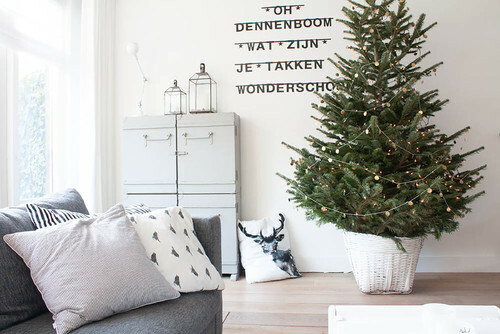 Complete the feel with a few throw pillows that have simple, natural designs (snowflakes, trees, rain deer, and the like). Adding candles to glass surfaces that reflect the light is a beautiful way to enhance the aesthetic of one simple embellishment. Red candles on one of our Jazz glass tables will glow warmly on dark evenings. Light plays an important role in Scandinavian design. First and foremost, natural light is a striking element. You don’t have to remodel your home if you have small windows. Using lightweight curtains instead of heavy drapes will give the light, airy feel of Nordic design. Candles and accent lamps are another way to invite good lighting in your home. For Christmas especially, the glow of flickering candles and strings of light creates festive cheer without requiring tons of decorating. Scandinavian design celebrates nature. 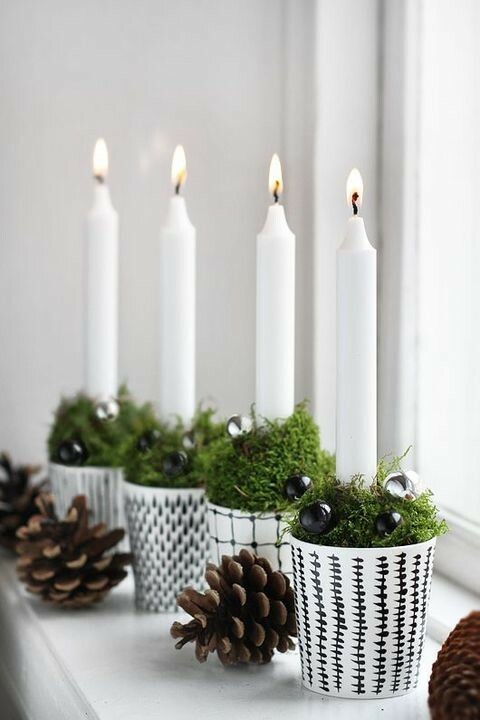 Sprinkle your home with greenery and pine cones to create the feel (and smell) of winter. This may be in the form of a few simple, natural wreaths or a centerpiece on the mantel or coffee table. Natural materials are popular: wool blankets, wicker baskets, wooden figurines. A red wool blanket folded in a wicker basket next to your Stressless Manhattan 3-Seater adds the perfect holiday touch for a cozy evening. Fur has also been popular in Scandinavian design although faux fur is replacing authentic pieces for ethical and environmental reasons. As you search out inspiration for Scandinavian decorating, you’ll see a theme emerge – simplicity. Whether you’re going after traditional or modern Scandinavian designs, the simple lines, neutral colors, and stylish appeal remain the same. Keep holiday decorating simple by adding a few, well-chosen accessories to celebrate the season. You’ll find the beauty and simplicity you’re looking for in Stressless furniture. Instead of busy patterns, you’ll discover the clean lines and solid neutrals you’ve come to love in Scandinavian home décor. If you’re interested in a mid-century design and beautiful minimalistic, Scandinavian styled furniture for your living room, come visit our showroom. Our ergonomically designed furniture will create a welcoming center in your home. If you’re at all interested in architecture or design, you’ve likely heard the expression “form follows function.” First coined by American architect Louis Sullivan, this axiom is one of the key principles in minimalist design, including Nordic design. Let’s take a closer look at this Scandinavian aesthetic and how you can incorporate its principles into your own home to maximum effect. Nordic design relies heavily on simple, clean lines for its minimalist appeal. Similar to mid-century modern design, Nordic furniture and furnishings are often geometric, and may boast gentle curves (think an oval coffee table or the gentle swoop of the iconic Arne Jacobsen chair). If you’ve ever stepped into an Ikea, you understand that simplicity is key in Nordic interior design. Pieces don’t have to be boxy, but they should never have intricate carvings, curlicues, or unnecessary frills. Where Nordic parts ways from mid-century modern is in its use of color. Scandinavian design uses a lot of light-colored wood, metal, and white or off-white. Neutral hues are the way to go when using Nordic design in a space, but that doesn’t mean your room has to be all white. Instead, look to earth tones like creamy beige, charcoal gray, light tans, pale greens and blue. These neutrals can be accented by brighter pops of color, of course. Bright grass green, the blue of the Swedish flag, a brilliant yellow or orange that brings to mind the flowers of midsummer — you get the idea. Just make sure not to overload the eye with multiple colors or clashing ones. Since Nordic design is all about simplicity, it should come as no surprise that bright and airy spaces should be devoid of clutter. Knick knacks and tchotchkes take the attention off the furniture and the color palette, so relegate them to the attic. It’s not necessary to clear the room of every item, but be sure that the ones you choose are in keeping with the rest of the furnishings. Consider elements like houseplants, floating shelves, a beautiful wooden bowl, a geometric print. Are you familiar with the Danish term hygge? It’s pronounced “hoo-gah,” and while it’s difficult to translate exactly, it refers to a sense of comfort and coziness. Hygge is the feeling of being snug and safe inside a warm home, surrounded by friends and family, perhaps enjoying a hot beverage or a big pot of chili or stew — while a winter storm rages outside. You might think that this concept would be hard to achieve in a minimalist environment, but Nordic design isn’t strictly minimalist. Yes, the clean lines, use of neutrals, and incorporation of negative space follow minimalist principles, but the Scandinavians invite comfort and warmth into the home, too. How? Largely with textiles like velvety blankets, soft and inviting pillows, and plush throw rugs. Plants and flowers help bring the warmth of nature into an otherwise stark space. And don’t forget the coasters for those mugs of hot chocolate! Check out Ekornes Stressless Furniture, which combines the beautiful lines of Nordic design with the comfort you expect — and deserve — from contemporary chairs, recliners, and sofas.